The Nigeria U-20 national football team will most likely be eliminated from the Cape Town U-20 International friendly tournament after losing to both Ghana U-20 and Argentina U-20. Based on their squad for the tournament, I am not very surprised. To be honest, this is the weakest Flying Eagles squad I have ever seen. A friend, who is a scout, is witnessing the tournament and described the Nigerian team as “horrible”. He suggested that no player from worth following after the tournament. These are perhaps harsh words but personally, I cannot understand how the Nigeria Football Federation can put together a squad consisting of fringe players and reserve players from Nigerian Premier League clubs, unknown players from second and third level clubs and even unattached players. I guess about 1/3 of all players in the Nigeria Premier League is (supposedly) under 20 years old and if these 25 players are the best of the best, I am worried about the future of Nigerian football. To be fair, I guess some of the best clubs in Nigeria could have denied their best U-20 players to participate in the tournament. The teams in Nigeria are playing a lot of matches in May and many coaches will probably dislike to lose key players to a friendly tournament. In this post, I will write a short profile on all players in the squad. * Okani is a petit goalkeeper who is totally unknown to me. His full name is either “Chukwunonye Samuel Okani” or “Chukwunenye Samuel Okani”. To be honest, I am a bit confused by this player. In April 2012, Okani was playing for Jigawa Golden Stars FC according to MTN Football, Complete Sports Nigeria, and most other sources. However, MTN Football recently wrote that Okani is playing for Enyimba FC. In any case, I have never heard of this player and if he is playing for Enyimba FC, he is most likely miles away from the first team. Okani was team captain when Nigeria U-20 lost 2-3 against Ghana U-20 on 25.05.2012. Apparently, Okani had a good game. According to some sources, Okani was one of the smallest players on the field. * Oyediran, sometimes referred to as “Yusuf Oyediran”, is a goalkeeper playing at second level side Ajiroba-Ooni FC, based in Ilé-Ifè in south-western Nigeria. * Innocent has played regularly for Niger Tornadoes FC this season but has not caught any headlines and he has yet to score his first top level goal. Confusingly, Innocent is referred to as a defender by some sources but as an attacker by most sources. * Kingsley, sometimes referred to as “Patrick Kingsley Onyebuchi”, has been a fringe player at Sharks FC for the last couple of seasons. According to 2muchsports, Kingsley is born 13.04.1987. It is difficult to say whether this is the correct date of birth. * Gero is a big and strong centre-forward. Alhaji played 14 matches without scoring a goal for Kaduna United FC before he joined Rangers during the mid-season transfer window. Gero has scored two league goals since joining the current leaders of the Nigeria Premier League. I think it is fair to say that Gero is one of the most interesting players in the Nigerian squad. My friend, who watched Gero when against both Ghana U-20 and Argentina U-20, described him as a powerful but rather clumsy player. However, according to 2muchsports, Orkuma is born 19.06.1993. In any case, Orkuma is a good player, described as a “lion-hearted playmaker”. It is difficult to define which of the two that is the correct date of birth. Orkuma is rather petit, but he uses his strength well, working hard and never letting his opponent rest. Orkuma has scored two league goals so far this season. * Last season, Anaezemba won promotion with Rising Stars FC before joining Enyimba FC before the Nigeria Premier League 2012. Anaezemba has scored two league goals so far this season and has made several impressive performances. The tricky winger can also play as a support striker. I would rate Anaezemba as one of the most interesting players in the squad. * Most experts thought Shehu would be a key player during the tournament. Pillars signed Shehu from Plateau United FC before the current season and the youngster has been largely impressive for the title-chasers from Kano. Shehu, an athletic and elegant player, has yet to score a goal for his new club, but scored twice for Plateau United FC during the Nigeria Premier League 2010-2011. * Okorie is yet another unknown player to me. He scored two penalty goals against Kwara United FC on 13.05.2012 and has featured regularly for Kaduna United FC this season. A player called “Ikechukwu Okorie” was part of the Nigeria U-23 national football team in 2007, most likely a different player. 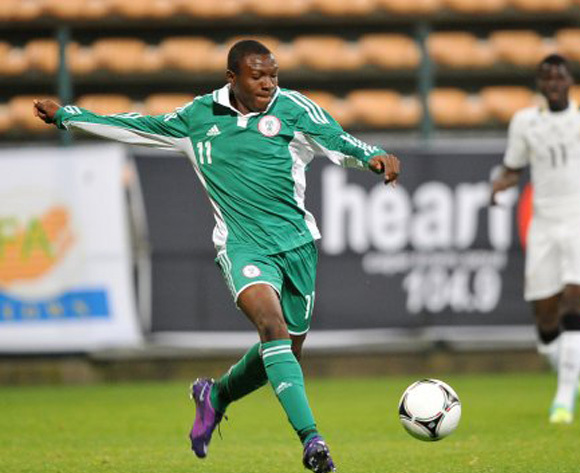 * Izuegbu is a strong and versatile player. Izuegbu, often referred to as Abonima Arinze Izuegbu, has been impressive for second level side 36 Lions FC. Apparently, Izuegbu has recently joined Sharks FC. * Promising player at second level side Bayelsa United FC where he has scored two goals this season. * Umar has scored one league goal for Wikki Tourists FC this season, as far as I know his first season at top level. Umar is a promising striker. The picture is of Umar and was found on MTN Football. * Obomate is an unknown player to me. He is most likely playing for the reserves of Sharks FC in Port Harcourt. * Ola is a fringe player at Enyimba FC, not playing regularly for the first team. However, I know that Ola is highly regarded at the club and he is probably a player to look out for in the future. According to 2muchsports, Ola is born 14.04.1995. * Somewhat of a mystery man to me. City of David United FC, mostly referred to as C.O.D United FC, has a great homepage and I am not able to find any player called “Christian Josiah” in their list of players or in their line-up from the first seven matches of the season. I am not able to find a player called “Christian Josiah” in their list of scorers from the next seven matches either. However, according to unconfirmed sources, a “Christian Josiah” has scored a couple of goals for C.O.D United FC during the FA Cup earlier this season. * Enyimba FC signed Agbo from JUTH FC before the current season. According to 2muchsports, Agbo is born in 1991, making him too old for the Nigeria U-20 national football team. According to http://foetbal247.wordpress.com/category/fresh-blood/, Agbo is born 30.01.1991. In any case, Agbo is an elegant midfielder who has done well for Enyimba FC. He has scored one goal so far this season. Agbo is a former player of FC Taraba. * Habu scored one league goal for Gombe United FC during the Nigeria Premier League 2010-2011. I have no record of the player from the current season. According to 2muchsports, Habu is born 12.10.1993. * Amaefule was a fringe player at Sharks FC during the Nigeria Premier League 2010-2011. According to 2muchsports, he is born 28.10.1993. Amaefule is currently playing for second level side Remo FC, based in Sagamu in southwestern Nigeria. * Completely unknown player to me. * Sikiru, a completely unknown player to me, is apparently playing at third level of Nigerian football. Ezenwaka has already turned 20 so I was a bit surprised to find him in a Nigeria U-20 squad. * Williams is one of the backup goalkeepers in the squad. He is completely unknown to me and apparently unattached at the time of writing. * Braye, sometimes referred to as “Brown Braye Okpus”, is apparently playing for Nembe City FC at second level of Nigerian football. * Aluko is playing at second level of Nigerian football for FRSC Strikers FC. Apparently, he had a terrible game at left-back when Nigeria U-20 lost 2-3 against Ghana U-20 on 25.05.2012. His full name is “Tolulope Samuel Aluko”. * Lukman, a completely unknown player to me, is apparently playing at third level of Nigerian football.